These models are sectioned to show its component parts and operation mechanisms. 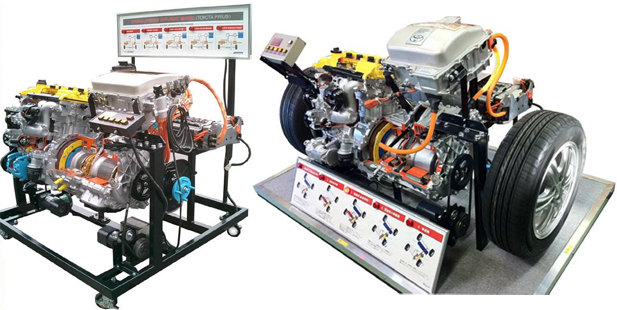 Students can easily understand and observe automotive mechanisms, such as engine generator, motor, reduction gear and drive shaft. 2 different types of power source, petrol engine and 3-phase AC electric motor, are operational and the operation is displayed on the panel. Also, various operation principles like starting, normal running, high load, reduced speed and reverse are explained on the panel. HV Battery cover is installed on the back of an engine.